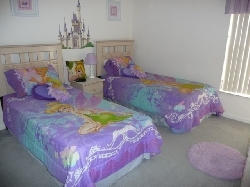 10/15 minutes from xDisneyx, our large, comfortable villa has 4 bedrooms, games room, 2 large lounges, its own caged pool and open plan garden. 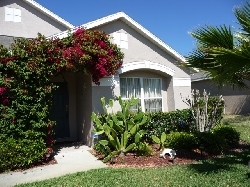 The gated development is on the popular Highway 27, and is set amongst the 1400 lakes, and orange groves, of Lake County. We are 5 minutes from xWalmartx. Also close by are other supermarkets, restaurants, fast food outlets (including a very good Chinese take-away), drug stores, video and xDVDx rental, banks, gas stations, post office. 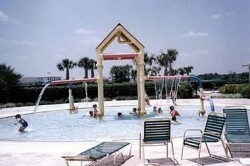 xLakex xLouisax xStatex Park is 5 minutes away, with its facilities for boating, fishing, swimming and nature trails. A few seconds walk away is the community centre, with its clubhouse, 3 pools � one with water spouts, for children � BBQ facilities, children's playground, sports facilities, including tennis, volleyball, basketball, a football pitch where hot air balloons land, jogging � all free of charge. There is also a conservation area. 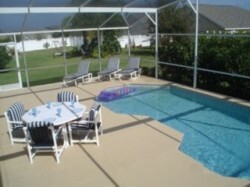 We supply all linen, including pool towels. The kitchen is fully equipped. 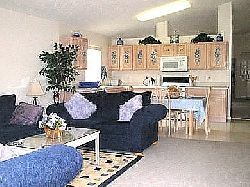 There is a separate laundry room, with washing machine, tumble dryer, etc. Each bathroom has a hairdryer. We also supply colour cable xTVsx, stereo, xVCRx and xDVDx players, radios, games, books, jigsaws. 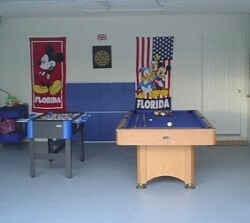 The Games Room has a foosball table, a pool table, table tennis, darts, and quoits. The large Master bedroom, with its American lighthouse theme, has a king-size bed, en suite bathroom, cable TV, walk-in wardrobe. 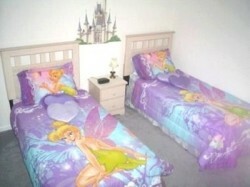 The pretty 2nd bedroom with its sea theme, has a queen-size bed, cable TV. 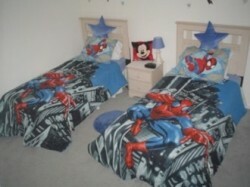 The Tinkerbell and Spiderman bedrooms each have twin beds. There is a second bathroom opposite the twins. There is a cleaning charge of x�50x for less than 7 nights. La caracter�stica es a localizado en Weston Hills, Clermont, Kissimmee, Orlando, Florida, US el dormir hasta 10 personas adentro 4 dormitorios. Hay 4 solas camas y 2 camas matrimoniales junto con 2 cuartos de ba�o y 2 tocadores.